Q. Is Citranox comparable to citric acid? A. Yes, 1-2% Citranox® Liquid Acid Cleaner and Detergent can be used to replace the kind of cleaning achievable from 1-2% citric acid. 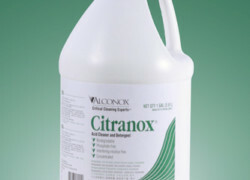 The Citranox cleaner formulation is approximately 1/3 citric and other organic acids by weight, but there are also wetting and penetrating agents that enhance the performance of the acids from a cleaning standpoint. Hence, we would expect it to be far more effective in the vast majority of applications. Note that to really get a roughly equivalent amount of acid in a 1% citric acid solution, you would need to use a 3% Citranox detergent solution. Silica, acid labile substances and other residues that the 1% Citric acid is designed to remove could also be removed by a 1% Citranox solution. 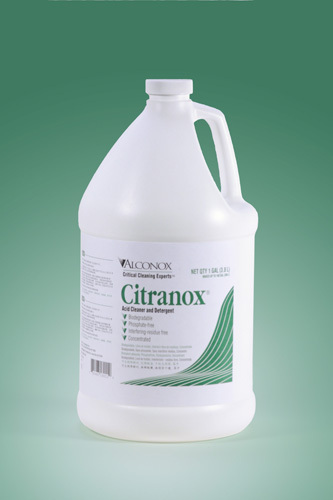 Extremely heavy scale buildup can also be removed by a 1-2% solution of Citranox. This may not be effectively cleaned when using citric acid by itself. A Citranox solution will eventually become exhausted (it’s cleaning capacity has been fully utilized). An exhausted solution will typically be very heavily discolored and the pH will have risen to higher than a pH of 3.5. Increasing the percentage of Citranox detergent used will directly increase it’s capacity. In such cases of bath exhaustion, a 1.5% or 2% solution of Citranox cleaner can be used.